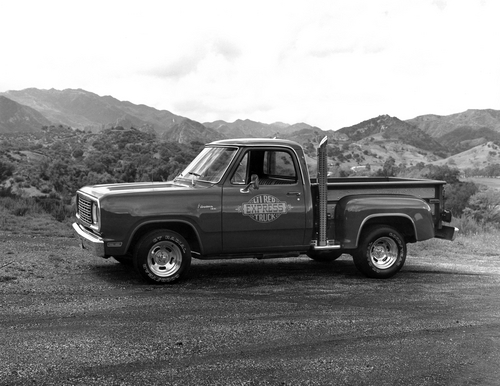 This edition of Muscle Car Milestones highlights the 1978–1979 Dodge Li’l Red Express. If you wanted the fastest vehicle in your garage in 1978, you didn’t bring home the Corvette, Trans Am, or even the Porshce 944. No, you brought home a truck called the Dodge Li’l Red Express. With its flashy red paint, twin exhaust stacks, and chrome wheels, this pickup drew a crowd anywhere it was driven. Let’s face it, the fun police were out to kill the muscle car any way they could in the late 70’s. The government had set forth so many rules regarding emissions that cars became strangled with all the clean air devices they now required. So, what do you get when you learn to bend the rules a little? For starters, you get a truck that will make mincemeat of most every muscle car that’s left. 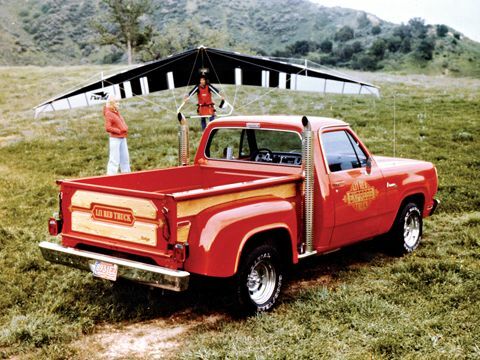 In the mid-1970’s, Dodge created a group of trucks and vans called “Adult Toys”. These were a group of trucks and vans that the buyer could customize and configure to their liking. In this toy box were the Warlock, the Street Van, and the Macho package for the Ramcharger and Power Wagon. 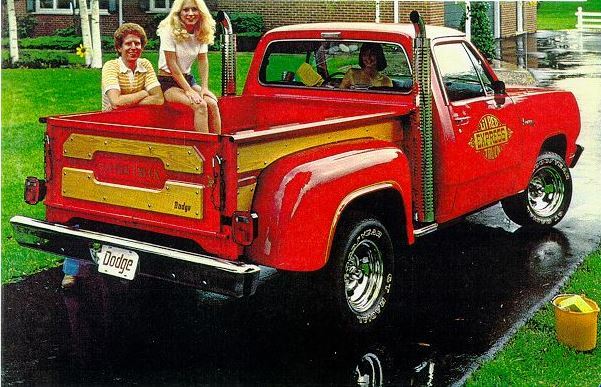 For 1978, Dodge added the Li’l Red Express to the mix. It remains the most popular and sought after “toy” from this collection. All Dodge Li’l Red Express trucks came from the factory painted in Bright Canyon Red in 1978 and Medium Canyon Red in 1979. Every Li’l Red Express was a regular cab Adventurer with a stepside bed. Gold pinstriping with accents stripe run along the edges of the front and rear fenders. Clear-coated oak wood trim panels adorn the bed and tailgate. The front and rear bumpers, 15-inch wheels, and side steps were plated in bright chrome. Speaking of chrome, the most eye-catching feature on this truck are the dual chrome exhaust stacks located behind the cab of the truck. These run from underneath the side steps and rise slightly above the height of the cab. This truck commands attention and gets it. Nothing else on the road looks quite like the Li’l Red Express. And isn’t that the point? If you’re going to be the fastest vehicle on the road, wouldn’t you want to look the part? Oh, and if you want to leave a lasting impression, smoke the Goodyears and leave a few black marks behind. Dodge gave buyers several choices when it came to the interior features of their Li’l Red Express. Drivers had the option of red or black trimmed seats, dashboard, and door panels along with a choice of bench or bucket seating. Options such as air conditioning with tinted glass could also be checked off on the option sheet. All Li’l Red Express trucks came with power steering and a column shifter. 1978 and early 1979 models came with the Tuff steering wheel. Other goodies such as Convenience Package, AM/FM radio, and oil pressure gauge came standard on the truck. The Li’l Red Express was not cheap. Checking off options such as bucket seats, air conditioning, and heavy duty front springs would set you back around $8,000. Still, this is about $5,000 cheaper than a Corvette equipped with the 220 horsepower L82 engine. The Dodge Li’l Red Express’ 360 CID V8 engine was the brainchild of Mopar powertrain engineer Tom Hoover. Tom discovered a couple gaps in the EPA’s rules on emissions for 1978. First, light duty trucks did not require a catalytic converter if their Gross Vehicle Weight rating was above 6,000 pounds. He also found out that a small number of modifications could be done to an engine without having to redo the EPA’s 50,000 mile certification testing. With these rules in mind, Tom got busy creating the engine for the Li’l Red Express. Tom started building the heart of the Li’l Red Express with a modified police code E58 engine block. From there, he added components such as the camshaft from the 1968 340 cubic-inch V8, intake manifold from the 1978 police 360 V8, and Carter 4-barrel carburetor. The engine was dressed up in light blue with chrome valve covers and air cleaner lid. Dual snorkel air intakes gather fresh air from underneath the truck. Power gets to the pavement via a A-727 Loadflight automatic transmission and 3:55 rear end. With 225 horsepower and 290 ft-lb of torque, the Li’l Red Express had just enough power to smoke the tires at the stoplight. On the strip, it could pace the quarter mile in about 15 seconds. Not bad considering this is 1978 and horsepower was basically a dirty word in this day and age. Respect came in spades from the Corvette and Trans Am crowd since you had one of the few vehicles that could keep them in check. A few changes for the Li’l Red Express came in 1979. The truck got a small refresh with rectangular headlamps and a flatter hood. Federal regulations crept in and required a catalytic converter that robbed a little bit of horsepower. A milder cam was also used and now the truck also required unleaded gasoline. An 85 MPH speedometer replaced the 100 mph speedo from the previous year. The good news was that production was up from 1978. 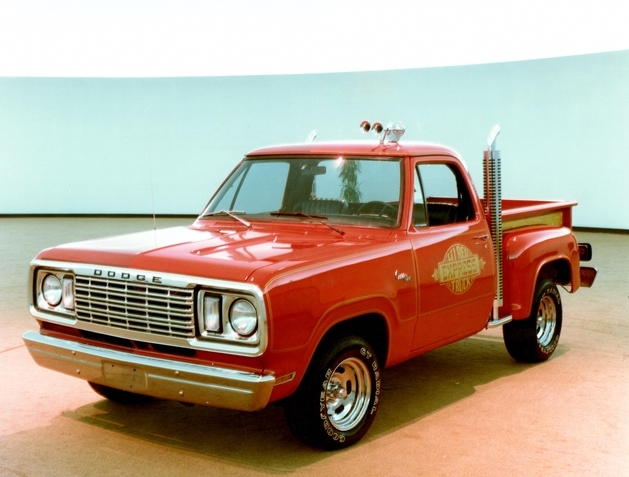 5,118 Li’l Red Express trucks rolled out of the factory for 1979. Unfortunately, 1979 would be the swan song for the Li’l Red Express. With gas prices soaring to $1.00 a gallon, many of the shiny red trucks squandered on dealer lots for months. 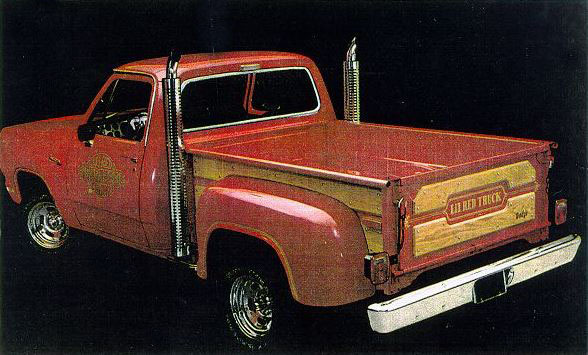 Without the Li’l Red Express, there might not have been a 454 SS or SVT Lightning. Heck, even the Dodge SRT-10 owes a little gratitude to the Li’l Red Express. They both share fastest production truck honors for their time.